All Sorts In Pink. Girls soft leather baby shoes in Pink with embroidered Allsorts sweets design. Rosa In Baby Pink. Girls soft leather baby shoes with embroidered pink roses with green petals design. Rosa In White. Girls soft leather baby shoes in white with embroidered pink roses with green petals design. Bunting In Baby Pink.Girls soft leather baby shoes in baby pink with multi coloured bunting design. Polka Dot White Boys. Boys soft leather baby shoes in white with mulit coloured polka dots in blue and green. Polka Dot White Girls. Girls soft leather baby shoes in white with multi coloured polka dots in pink and green. Polka Dot Baby Blue. Boys soft leather baby shoes in baby blue with white polka dots design. Rosebud White. Girls soft leather baby shoes in white with baby pink satin roses with leaves and satin ribbon trim. Rosebud Baby Pink. Girls soft leather baby shoes in baby pink with baby pink satin roses with leaves and a satin ribbon trim. Polka Dot In Chocolate And Multi Colours. Girls soft leather baby shoes in chocolate with multi coloured polka dots design. Cupcakes Pink. 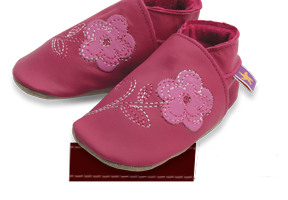 Girls soft leather baby shoes in Pink with embroidered cupcakes design.